For instance, I’ve experimentedÂ back-emf while trying to control DC motor. This was very fun and produced very nice data and graphs. But those were done after the experiment. 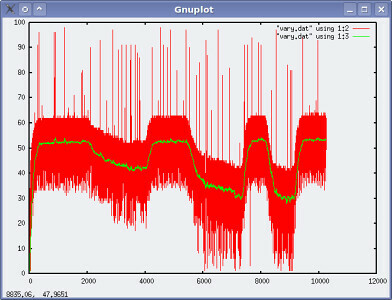 I just logged raw data on a file, then process them with a awful python script to build gnuplot graphs. Where is the real-time ? Observing these graphs in real-time is now mandatory. I need to know what’s going on this bot ! I first tried and thought to have a solution withÂ Flex. Interestingly enough, Flex can be used to build GUI with real-time data. It’s quite fun to use, compiler is open-source, documentation is awesome. Lots of widgets are available, for free, likeÂ Fusion Charts. And it’s cross-platform since it’s all about Flash. 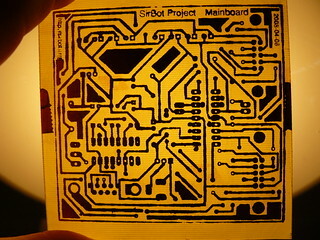 I prototyped and even wrote a Flash gateway to spread message from the SirBot’s core, over a Flash XMLSocket. Worked great, nice performance. Then I tried to add some colors and… you have to sub-class, add callbacks for whatever I don’t know, etc… I may have missed something, but it looks too complicated for just what I want to do. And most importantly, I’ll need to design a layout, add a menu, add a button here, write the code so when to button here is pressed, then it switch on this pane. I just don’t have time ! So, how can I do this ? How can I build a rich GUI, with real-time widgets, easy and fast to implement ? Which tool(s) to use ? Is there a tool which can do this ? Though I’ve never tried it,Â LabviewÂ seems to be a solution, but it’s way, way too much expensive, and there’s no free-of-charge edition for the “cheap guy”… Looks like I need aÂ Labview alternative. During this “quest”, I’ve found many interesting projects. What can be surprising is most of the time, this is about sounds, videos and artistic related projects. I first foundÂ EyeswebÂ throughÂ BioMobius, which integrates it, adds blocks dedicated to the biomedical field (and also provides an awful GUI builder…).Â EyeswebÂ is free, works on Windows. It looks very powerful, and seems to be a real Labview-alternative. Its first purpose was about to deal with audio and video, in real-time, with motion-capture, for artistic projects. I can remember having read it was used on a opera, to produce nice visual effects according to what’s going on the scene. Pure DataÂ is an old project. I’ve seen many incredible videos on youtube about it. Though it has a visual environment, it’s more like classical “type” programming: you have to know objects’ name, and what you can do with them. Runs under Linux. I did not give a try with this one, but it looks very powerful and fast. It may be too much audio-oriented. Max/MSPÂ is derived from Pure Data. Lots of nice widgets. Runs under Mac and Windows. Not Linux. Open Sound Control. Not a GUI toolkit nor a tool by itself, but a specification: “Open Sound Control (OSC) is a protocol for communication among computers, sound synthesizers, and other multimedia devices that is optimized for modern networking technology.” Many, many tools I’ve found, included those listed here (and particularlyÂ Eyesweb), can useÂ OSCÂ as input.Â OSCÂ is used inÂ many areasÂ other than sounds. I think I’ll need to implement a OSC output in SirBot’s core. From their site: “Fluxus reads live audio, midi orÂ OSCÂ network messages which can be used as a source of animation data for realtime performances or installations. Keyboard or mouse input can also be read for games development, and aÂ physics engineÂ is included for realtime simulations of rigid body dynamics.” Looks fun ! While not directly usable for what I want (and from what I understand), it may be interesting to keep this in mind. For instance, it could be used to “just” produce a visual… stuff which globally represents the bot’s state. No “scientific” graphs, or the like. 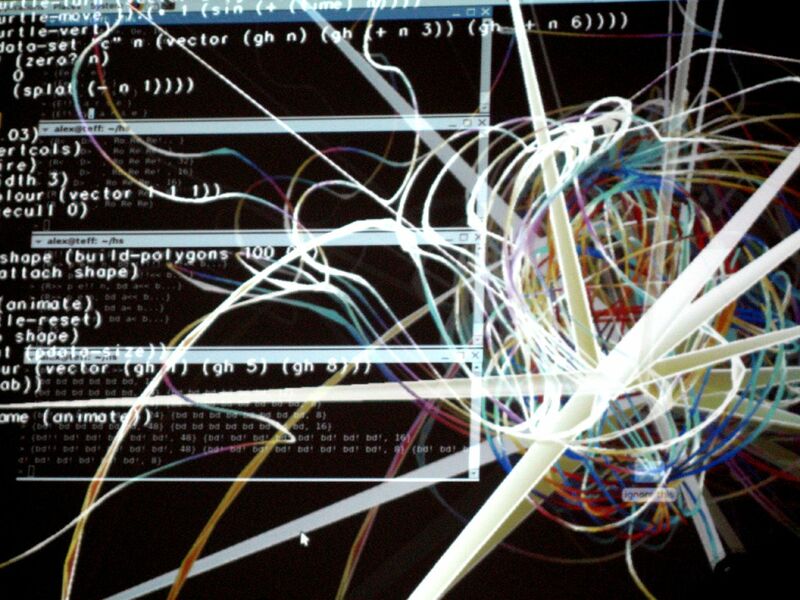 Just… visual stuff.Â FluxusÂ can be programmed in live (seeÂ this videoÂ for more). No GUI, no visual programming. So, which to choose ? I don’t know yet, butÂ EyesWebÂ probably fits my needs the best. Others are of interest too, but maybe not right now. 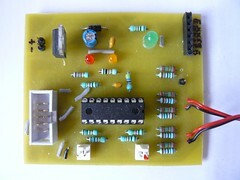 I have to spend more time onÂ EyesWeb, and build a real prototype for validation, probably based on a OSC server/gateway. 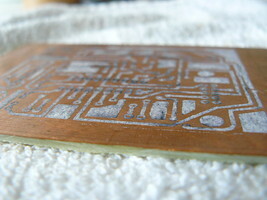 Having recently tested a lot this method, I’ve finally determine my "easy and cheap" way to build PCB using toner transfer method. I tried a lot of things, different papers. I’ve also tested the professional photoengraving method, this one can be considered for the most accurate (but certainly not the cheapest). So, what’s the recipe ? This is closed to the last one, but now way faster, since only ~ 10 minutes are needed. Main difference is you don’t have to be careful while peel off the paper, toner really sticks firmly, there’s no risk damaging the tracks. 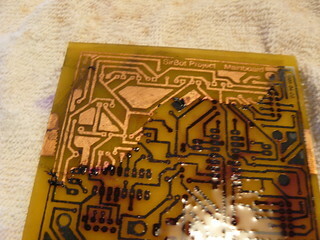 wash your PCB board with soap, then with window cleaner (or detergent with alcohol). wash again the board with soap, then with window cleaner. It must absolutely be dry. place the paper on the board. Be careful, it’ll instantly stick to the board. 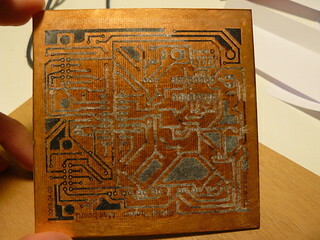 continue with the iron tip, and redraw all the circuit (black tracks will appear through the paper), for ~4/5min. 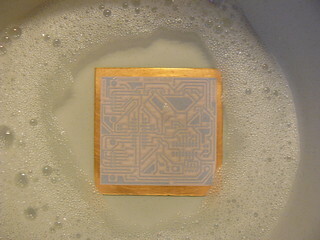 then place the board on hot water, no soap. Wait for ~ 3/4 minutes, watching the paper beeing soaked. peel-off the paper. 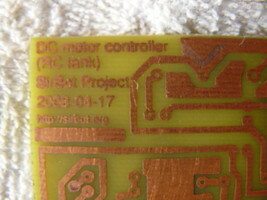 Most can easily be removed, only the last layer, where the toner sticks, will mostly remain on the board. peel-off again the paper with a toothbrush. 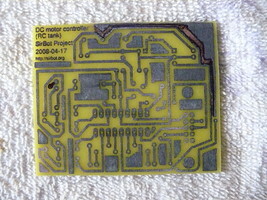 Don’t hesitate, it won’t damage your PCB. once done, dry the board. Check if you’ve missed some paper. clean the board with window cleaner. 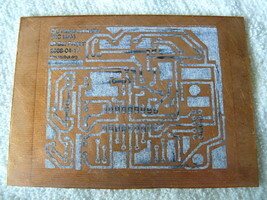 While it won’t remove toner, it’ll help to remove paper residue and get an accurate board. 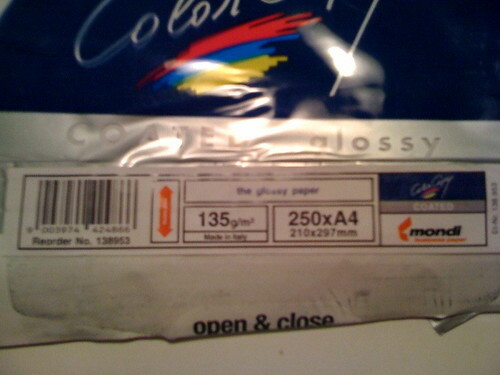 [EDIT 2009-09-10] : here are some photos of the glossy paper I use, hoping it’ll help choose the correct type. 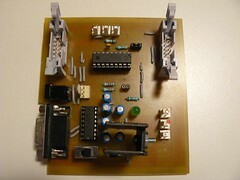 Two new boards are available fromÂ SirBotÂ Modules. Both are using a newÂ bus cableÂ connector, and were designed using Eagle. 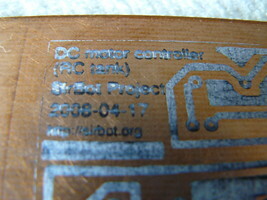 aÂ DC motor controller board: can be drive existing h-bridges, such as those found in RC toys. Extremely configurable and extensible, highly documented. This jal v2 master implementation isn’t based on interrupts: since it’s the master which decides to take control of the bus, there’s no need to react to external event… except when usingÂ Multi-Master i2c bus. To help this, 16F88 can be configured to generate interrupts on START/STOP bits (which defines when the bus is available or not). A Multi-Master i2c bus seems great but I didn’t give a try, regarding all the debugging time it took me to set a “simple” 1-Master/1-Slave bus. That is, if the slave is declared to have 0x5C address, the master will have to talk to 0x2E as jalv2 is actually shifting 1-bit while building a write- or a read-address. As usual (and as everyone seems to report),Â i2c com. problems mainly come from address issues. Setting a i2c bus is quite easy, from a hardware point of view.Â SDA and SCL pins must be connected on each side, on a bus using pull-upÂ resistors to +5V. Different values can be used, they’re determining the stability and the bus speed. I’ve successfully tried 2.2K and 3.3K, these are standard values. Finally, here’s aÂ two small Jal programs to test this i2c bus. The master 16F88, also connected via UART, gets a character from serial (from a PC), echoes it and send it to slave 16F88. This ones gets this char, process it (char = char + 1…). The master then gets the result and send it back to the PC. So, if you type “a”, you’ll get “a” as echo, then “b” as the slave’s results. 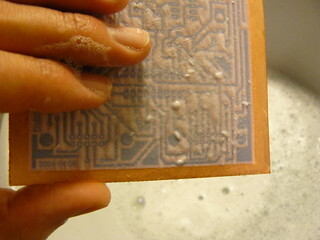 washÂ your PCB board withÂ soap, then withÂ window cleanerÂ (or detergent with alcohol). wash again the boardÂ with soap, then with window cleaner. It must absolutely beÂ dry. 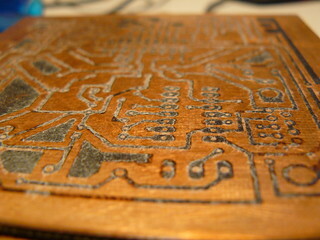 continue with the iron tip, and redraw all the circuit (black tracks will appear through the paper), for ~5min. 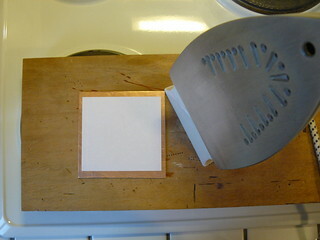 thenÂ place the board on hot water, no soap.Â Soak it for 30min. once done,Â dry the board. Check if you’ve missed some paper. Once all paper has been peeled-off, here’s the global result: tracks are still covered with paper, but the whole seems accurate. Zooming shows tracks are perfectly accurate, even holes in pads. Text is too fuzzy won’t be rendered well if left as is. Using window cleaner can help removing extra paper residue. I’m not comfortable using glossy paper for inkjet on a laser printer. It can stick on the fuser and ruins the printer. Some people mentionthis. Others pretends to nice results using normal,Â standard paper. Some also have amazing results usingÂ mailing label backing paper, orÂ glossy photo paper for laser printer. For now,Â I have tried standard paper,Â label paperÂ andÂ glossy photo paper for laser printer(see following results, except for label paper: I didn’t even managed to print on it…). Everyone seems to report it.Â The board has to be clean.Â Very clean. 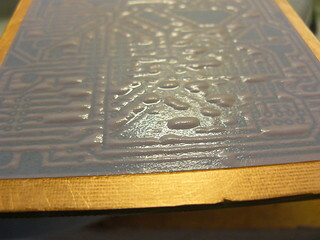 Some are saying it’s important to prepare it using sand paper (or the like) so the toner has something to grip to. I’m always following those advices: clean the board with soap, use very thin sand paper, clean it again with soap, then clean it again with window cleaner to help drying it. It’s ready. About my iron, it’s an old one. It doesn’t heat a lot.Â I tend to iron a lot of time, while I’m not sure it’s a good idea. I think it depends on how the toner has been fixed onto the paper. My first attempt was usingÂ standard paper. This was a on very small testing board, and results were amazing. 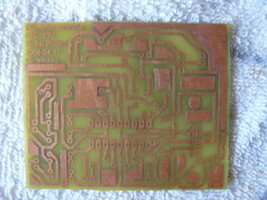 Then I tried on a real PCB (photo). Several times. At least 4 times (maybe 5). And it always failed…Anyway, whatever the paper type is, the board has to be a little bitÂ largerÂ than the paper. Ironing will be easier and everywhere the same (hopefully). Again, whatever the paper, the board has to be cleaned and prepared usingsandpaper. 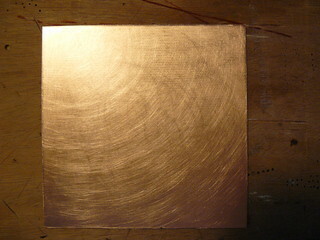 I use very thin sand paper, one used to sand body car. I clean it usingÂ soapÂ and ultimately usingÂ window cleanerÂ (or something with alcohol): it helps to get aÂ dry board. 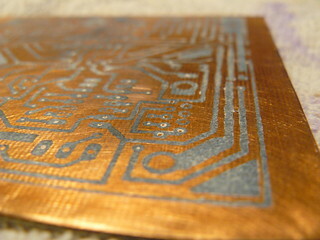 The paper is then put down on the board, toner side on copper side.Â Pre-heat the boardÂ (using another paper, without any dust or the like). While youÂ stick the paper to the board, be sure you’re right because the toner will instantly grip the board. Iron the paper. Use aÂ lot of pressure,Â everywhere. For this board, I’ve tested different ironing times: 5min to 12min, all attempts have failed…Iif you’re not ironing enough, some tracks won’t stick to board (I’ve observed). If you iron too much, tracks will get fuzzy (I’ve never observed it). 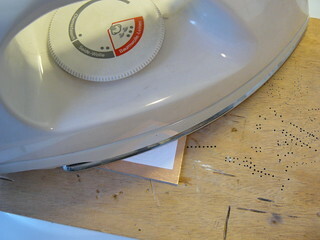 I think ironing this board (10cm x 10cm) for at least 10min is ok.
After 15min, the board shows bubbles on its surface: every piece of paper without toner gets unstuck (remember,Â standard paper). 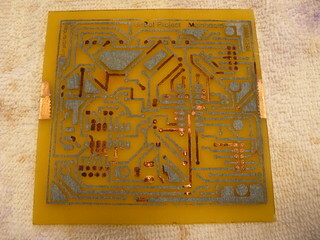 This clearly shows how well the toner has fixed the board. That’s promising… You may not observe those bubbles using glossy papers. 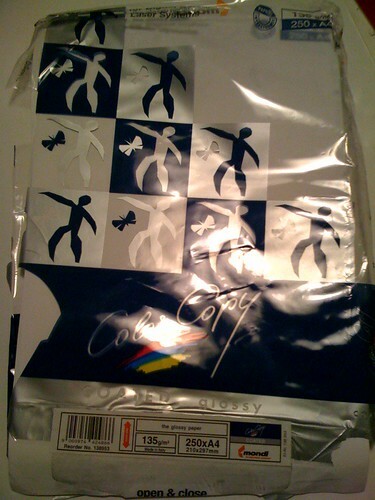 You can then start toÂ gently rub the paper. You should be able to easily remove most of the paper. Only the last layer will cause problems (and still cause problems…). You shouldÂ notÂ doing this, but who could resist… Just be sure not to damage any tracks. 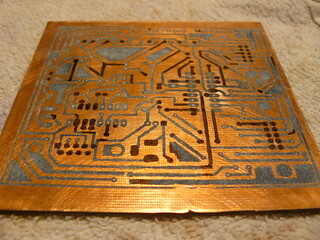 Another one… this time usingÂ glossy photo paper for laser. While there’s still paper on tracks, those are accurate, well limited and quite consistent. Having paper residue is not a problem, it’s the way it sticks that is important. Some tracks were damaged (still). I needed toÂ double-check the boardÂ andcorrect those errorsÂ with aÂ PCB pen. Note, on this pictures, one pen trace doesn’t mean one error: I redraw some of the tracks too make them larger. There were maybe 3 errors for the whole board. 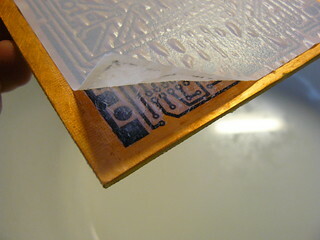 I think ÂµI didn’t iron enough.Once ready, put the board intoÂ etchant. I continually move the board into the etchant (for 18min for this one), to be sure the board is etched everywhere, equally (hopefully). Clean the remaining toner. People say it cannot be removed without acetone. I use nail cleanerÂ withoutÂ acetone, and it works perfectly. Tadaaa (again) ! 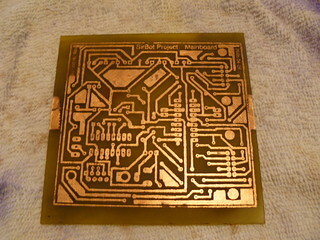 Ready for soldering ! A nice looking result. 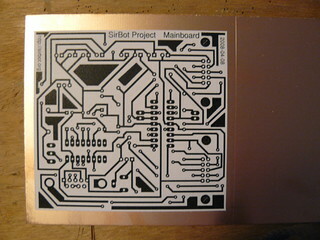 I can even read “SirBot ProjectÂ Â Mainboard” and the very small date “2008-04-08″.